UW Alzheimer disease researchers and epidemiologists have combined forces to identify the effect of air pollution on memory and dementia risk. They will leverage 30 years of data from a “living learning laboratory of aging” at the UW. Air pollution in America, at the lowest it’s been in four decades, is still a major public health problem. It’s also a public brain health problem, linked to raised risk of cognitive decline. Now, on the heels of new National Institutes of Health (NIA, NIEHS) funding, the UW has launched a collaboration of neuroscientists, environmental scientists, epidemiologists, and biostatisticians to identify the effects of local air pollution exposures on memory and the risk for Alzheimer’s disease and other dementias in the aging population of the Puget Sound region of Washington State. 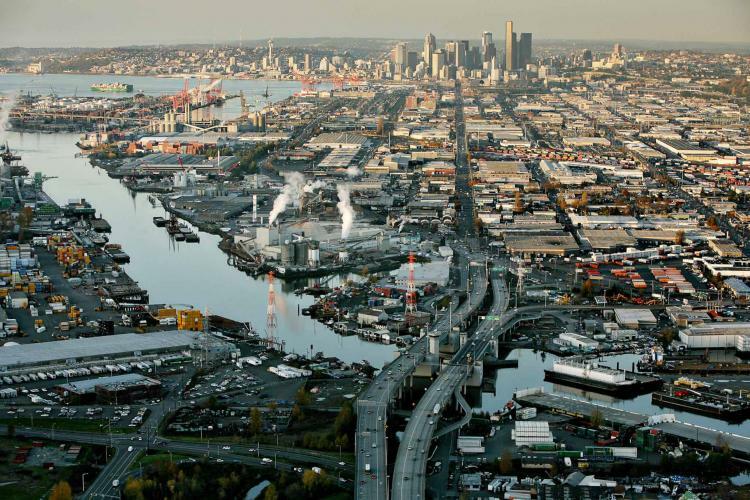 The project has a running start, thanks to the systematic cultivation of data resources in Seattle over decades. 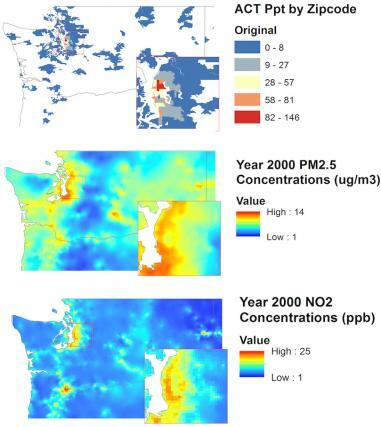 The researchers are leveraging the cohort of the Adult Changes in Thought Study (ACT), a longitudinal study on cognitive aging led by the UW Medicine and the Group Health Research Institute (GHRI) in its 30th year of continual funding, and 40 years of air pollution monitoring data from the Puget Sound Clean Air Agency. “This study is particularly exciting because it adds geographical information systems (GIS) approaches to the many sources of data we are able to tap into to learn more and more about the aging brain,” says Dr. Paul Crane, multiple PI of the ACT study and a faculty member of UW Medicine. To improve their computer modeling of local air pollution exposure, the epidemiology team will deploy new networks of sensors to take additional measurements of ambient fine particulate matter, ozone, and nitrogen oxides in ACT participant’s neighborhoods. Since 1986, the ACT Study has followed over 5,000 aging participants from the community from age 65 and older, collecting information on health and cognitive function every 2 years. Some develop dementia, and some agree to donate their brains at the end of life. The ACT uses this extensive data resource to identify the environmental and genetic factors that increase the risk of brain disease and find ways to help communities delay or avoid dementia. In these area maps of air pollution, colors give you a sense of the level of air pollution and its variation in space. Courtesy Lianne Sheppard. ACT—what Dr. Eric Larson, co-principal investigator and founding director of the study, calls a “living learning laboratory of aging”—provides a readymade study population, making it possible to perform retrospective health research without the cost it would normally require. At the very beginning, Larson made sure that the ACT collected information on participants' socio-economic status, places of residence and work, and neighborhood characteristics—all important data points for answering epidemiological questions about air pollution exposure. Thanks to the ACT study, the new air pollution project avoids one of the major weaknesses in air pollution and dementia research—a lack of granularity of the medical data collected. Indeed, existing epidemiological studies on dementia have pulled Medicare records to identify the dementia diagnoses in a population. But research suggests that Medicare claims over count the prevalence of dementia. In one study, of all people with Medicare claims for dementia, only about 56% actually had the condition. The air pollution-dementia link might reside in the heart. For ten years, Sheppard has been part of the Multi-Ethnic Study of Atherosclerosis and Air Pollution (MESA Air), the first U.S. research study to examine how long-term exposure to air pollution contributes to the development of heart disease in six U.S. cities. The long-awaited findings, recently published in Lancet, show that air pollution increases the accumulation of coronary artery calcium, a subclinical marker of heart disease, even at levels near the National Ambient Air Quality Standards. Heart disease is the leading cause of death in America. The project also involves neuropathological examination of the donated brain tissue in the ACT study. “A first in longitudinal epidemiological research,” notes Weuve. This work, led by Dr. Dirk Keene of UW Medicine and the ADRC, aims to help identify the possible pathways, such as inflammation and oxidative damage, by which air pollution contributes to plaques and tangles or directly kills neurons. Ultimately, the researchers hope to provide the strong research findings needed for regulators to even consider re-shaping environmental policy, with the brain in mind. Sheppard is more optimistic than impatient. She says that she chooses to study air pollution, not because it's definitely the worst pollutant, but because the existing mechanisms to tighten regulations available through the Clean Air Act, as well as the ease of monitoring air pollution, make effective research and policy change possible. The nice thing about air pollution exposures of all kinds is that we have control, collectively as a society, over how much pollution is acceptable. And if we change the regulations according to scientific research, we can affect the cognitive health of everybody who breathes the air.